SEQuaderma uses the ‘Innovation Award’ winning Sequessome Nanotechnology® to create a range of skin care products for the care of skin affected by conditions as acne, rosacea, eczema, seborrheic dermatitis, skin ageing and hyperpigmentation. Following the interest seen in the last SEQuaderma giveaway on the blog, the team at SEQuaderma are back with another giveaway. This time there will be 10 winners. And just like last time, the winners will get to choose their product. The competition runs until Mother's Day and the 10 lucky winners can pick any one of the six products from SEQuaderma's range. Each of the products is targeted for specific skin conditions like Rosacea, Eczema, Acne, Dermatitis and Ageing & Thinning skin etc. Entry, as always, is very simple. Enter using the widget below. All the best! I've not tried any SEQuaderma products before but I'd love to try the 'Ageing Thinning Skin' gel. Ive never tried before but so would love to try the SEQUADERMA UNEVEN SKIN TONE! exciting! I've never used SEQUADERMA products before but I'd love to give them a try. The product for aging skin would be my choice I haven't tried any before. I've never tried it but I would love to sample the uneven skin tone cream. Yes I have used these products before. I have never used these products and would love to try the Ageing Thinning Skincare. 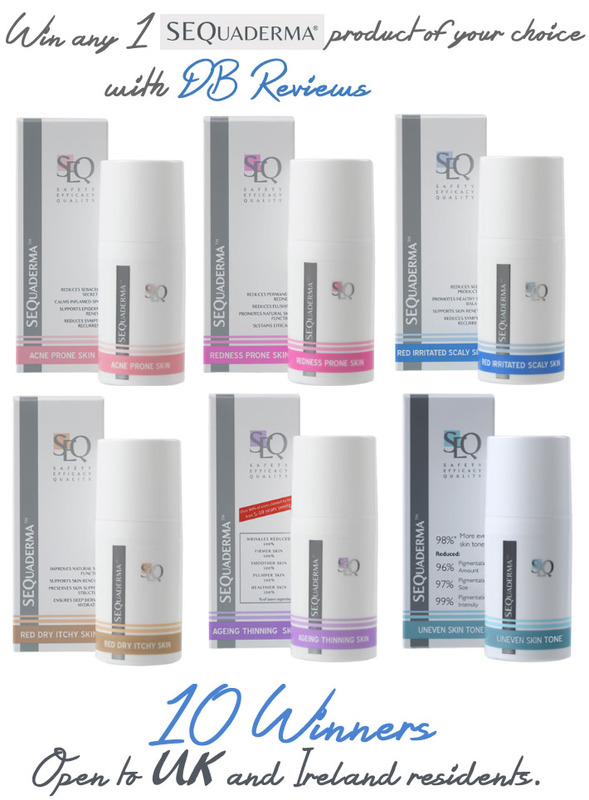 I've never used SEQUADERMA products before but id love to try the SEQUADERMA UNEVEN SKIN TONE! Would love to try SEQUADERMA AGEING THINNING SKIN product because it would be awesome for my skin. I have and they're great! I haven't yet used these products but would love to try the one for acne prone skin. I've never used this but would like to try the product for red & dry skin. I haven't tried these products but I'd love to try the Redness relief serum! i haven't used them before but the acne prone skin one would be the one for me! I haven't tried any before but would love to try the Ageing Thinning Skin gel. After years of sun abuse I have darker patches on my skin, hyperpigmentation, I would love to try SEQuaderma to help! I haven't tried but would like to try the Redness serum! I have not yet used these products, I would like to try the one for uneven skin tone. Not tried any of it I'd like anything for older skin. I've never tried their products before but I'd love to try and see if their products help with hyperpigmentation,and dry patchy skin. No but I'd love to try it!